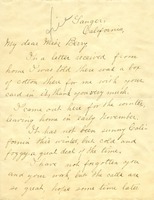 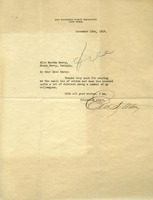 Bertha Black writes to Martha Berry thanking her for the box of cotton that was sent to her. 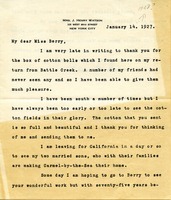 She discusses the weather and hopes that Martha Berry is well and hopes she has escaped the flu. 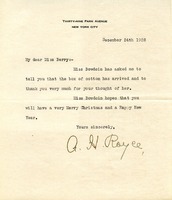 Mr. Lloyd thanks Miss Berry for the box of cotton she sent as a Christmas greeting. 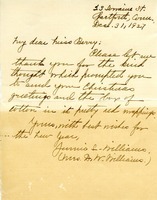 Mrs. Williams thanks Martha Berry for the box of cotton that was sent to her at Christmas time. 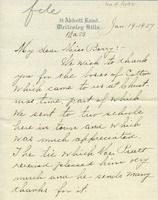 Mr. Stetson is thanking Miss Berry for a small box of cotton that she sent him. 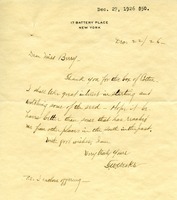 Mrs. Ina A. Pratt thanks Martha Berry for the boxes of cotton as well as the tie for Mr. Pratt that she received at Christmas time. 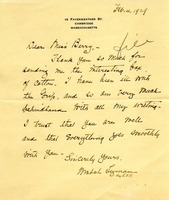 Miss Kolbe thanks Martha Berry for the box of cotton and calendar that were sent to her at Christmas time. 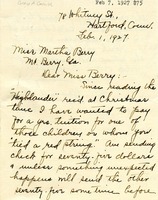 She also sends a $25.00 donation to the Berry Schools. 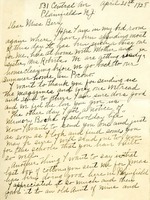 Miss Gould writes to Martha with half of a donation for a scholarship, and writes that she will send the other half at a later date when circumstances allow.